In John Paul II's book Crossing the Threshold of the Hope, he also personally passed another threshold, that of the total identification of a Pope with his mission. Indeed, it was the first time in History in which a Pope did not speak as such, but as an individual who freely presents his own opinions. Up to then every Pope presented himself fully as the representative of Our Lord Jesus Christ and the head of His Church. John Paul II made an innovation: with this initiative, he hung up the authority of his mission for a while to be just the citizen Karol Wojtyla. The work was a book-interview conducted by Italian journalist Vittorio Messori. 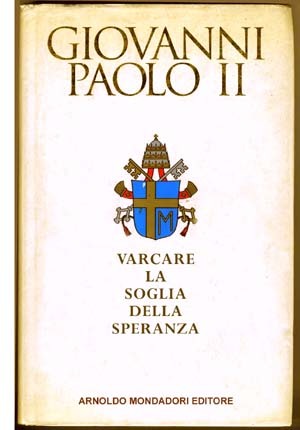 It was published by a lay publishing house and not by the Vatican: another democratization of the Papacy. In the text below JPII addresses Animism, which is a generic name including those sects that worship the souls of their ancestors along with other spirits, namely the Devil, who is worshipped under many different names. 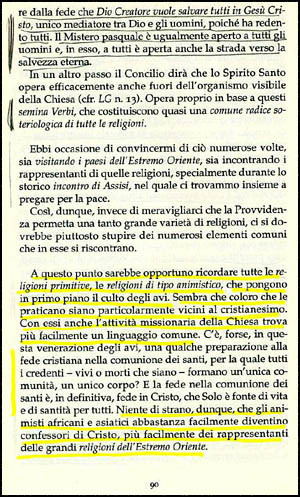 At right, the cover of Passing the Threshold of Hope; directly below, a photocopy from the Italian text; below, our translation of the parts highlighted in yellow. At this point, it seems opportune to recall all the primitive religions, the Animist type of religion, which puts first emphasis on the worship of their ancestors. It seems that those who practice it are particularly close to Christianity. Among them the missionaries of the Church more easily find a common language. Is there, perhaps, in this veneration of the ancestors a kind of preparation for the Christian belief in the communion of saints, wherein all believers - whether living or dead - form a single community, a single body? Faith in the communion of the saints is, ultimately, faith in Christ, the only source of life and holiness for all. There is nothing strange, then, in the fact that the African and Asian animists would become confessors of Christ more easily than followers of the great religions of the Far East.